Two cloud radars are operated at Chilbolton. The UFAM 35 GHz 'Copernicus' radar operates round the clock, providing reflectivity, depolarisation ratio, and Doppler measurements every 30s, as well as a full Doppler spectrum profile every minute when cloud is present. At 35 GHz the reflectivity from cloud particles is predominantly through Rayleigh scattering. However, in ice clouds where the particles are millimetres in size, the backscatter at 94 GHz can have a significant non-Rayleigh component. The difference between the two co-located radar reflectivity and Doppler measurements can provide important information on ice particle size and density (see Hogan et al 2000). This information is very important for estimating the ice water content of clouds from radar. Quicklooks for the 35GHz radar are available in real-time. The 94 (left) and 35 (right) GHz cloud radars at Chilbolton. 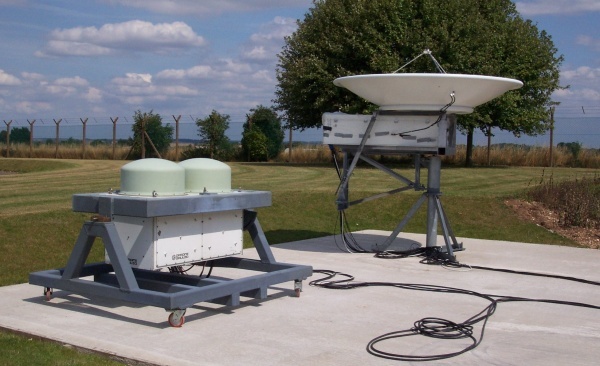 The UFAM 35-GHz radar is a fully coherent Ka band instrument with a 2.4m dish. Pulse coding is used to provide enhanced sensitivity (a 10-bit code yields an extra 10dB over an uncoded pulse), allowing the detection of low reflectivity liquid water clouds and thin cirrus cloud. In addition, approximately 3 dB of sensitivity is gained by coherently integrating each pulse pair. Importantly, the radar also transmits uncoded pulses: the coded and uncoded pulses are interleaved on a pulse-to-pulse basis, effectively allowing simultaneous measurement with and without pulse compression, enabling direct comparisons between coded and uncoded data. This allows erroneous features introduced by the coding to be identified, such as range side-lobes, which can be a problem in regions with a high reflectivity gradient. The ESTEC-funded 94-GHz Galileo radar at Chilbolton is well suited to cloud measurements: its shorter wavelength (3.2mm) makes it particularly sensitivity to cloud droplets and ice particles. The instrument has full Doppler capability, enabling high-resolution measurements to be made of the spectrum of particle fall speeds. The non-Rayleigh component to the reflectivity and Doppler weighting for large snowflakes (~1mm or bigger) allow important information about ice particle shape and size to be derived.